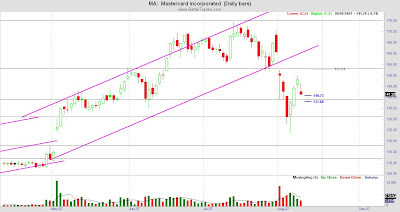 Here with MA it's in a downward trend where the upward trend it was in for quite some time was broken at earnings. The prior 3 days before yesterday looked like a pullback of near 50% and with yesterday's candle, that could be a continuation of the downward trend or with the inverted hammer, that has a 70% chance of reversal, which is quite high. However, that would be at support and if we look to the left, that was a support area before. Downside Target @ $118 to fill the gap. MA has not been real great at filling gaps, so this may be the start of them doing that. My indicators all show there is more room to move to the downside. 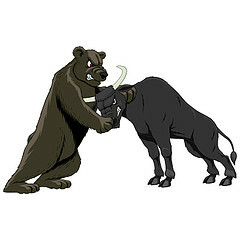 In reality, if I were playing this, and I may, I would probably only take a bearish position. For a bullish position, I would probably wait just a little longer for confirmation to the upside as I don't really want to get whipsawed.